In a great feature authored by ESPN’s Jeffri Chadiha that ran this week, Denver Broncos cornerback Aqib Talib talked about rebuilding his reputation and rejuvenating a career that began with All-Pro potential but almost went off the rails following a string of off-the-field problems in Tampa Bay. Talib played four and a half seasons with the Buccaneers before being traded to the New England Patriots in 2012 while he was serving a league suspension for performance-enhancing drugs. In 2013, his only full season with the Pats, he collected four interceptions and was named to the AFC Pro Bowl squad. A free agent in 2014, Talib signed a six-year, $57 million contract with the Broncos. Although he is as talented as any corner in the league, Talib was known mostly for his legal scrapes and behavior issues before his Pro Bowl breakout. A first-round draft pick out of Kansas in 2008, Talib was getting into trouble with the NFL before he even made it onto the field. He was involved in a fight with another player at that year’s rookie symposium. Later that season, he got into a fight at practice with a Tampa Bay teammate. The next year Talib was arrested for allegedly punching a taxi driver in Florida. In 2011, he was indicted on aggravated assault charges for allegedly firing a gun at his sister’s boyfriend. Then there was the NFL suspension for PEDs. While the legal cases against Talib didn’t stick, the constant bad press and character concerns became too much for the Bucs. But as the NFL struggles with an assortment of criminal issues that have made people question the state of the league, Talib feels as if his ability to avoid trouble since being traded out of Tampa Bay midway through the 2012 season indicates that he’s on the right track. 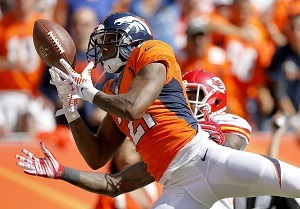 Through Denver’s first three games this season, Talib has 12 tackles and five pass breakups. In this Sunday’s game against the Arizona Cardinals, he’ll likely spend a lot of time covering eight-time Pro Bowl receiver Larry Fitzgerald. You can read the entire ESPN feature on Talib HERE.